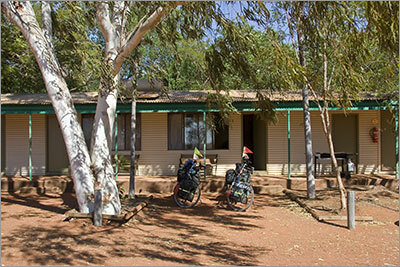 After 5 days of luxury at the Ochre Moon B & B we reluctantly packed and loaded the bikes last night and began our preparations for the ride to Sandfire Roadhouse. Due to the amount of water required for the three day ride we found we had to repack and redistribute the water, as the trailers were not as stable as we liked. 65 litres of water, (spread between the two bikes), is a very big moving weight and it was not that easy getting the 25 litres on each trailer loaded so that we could not feel it moving as we rode. 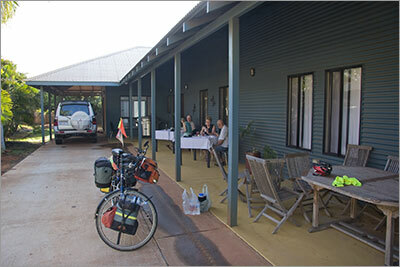 As we arrived at Roebuck Plains Roadhouse we met Stefan, a Swiss cyclist just starting his ride from Broome to Cairns via the Tanami Track and Plenty Highway. 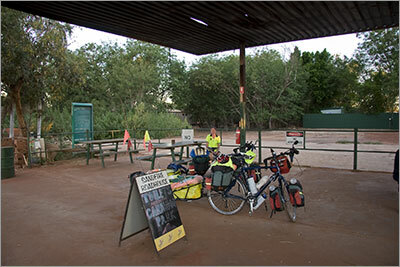 We told him about the high temperatures being experienced in Halls Creek and along his route, but this seemed to add to the attraction of the remote ride for him. We are certainly glad to not be doing the same trip and trust he is getting on OK.
On Tuesday night we found a nice campsite not far from the road and watched the sunset as we set up camp. It was a relief to be stopped for the day after battling side and head winds most of the day. Due to the warm night we pitched the tent without the fly which turned out to be a small mistake as a heavy dew formed later in the evening. We started to pack up at 4.00am on Wednesday morning and made an early start to avoid the wind, but it was not long before it was blowing again. It was also getting hot so we were always looking for a good shady spot for our breaks. Late in the morning we came across a sign for Munro Station Farm Stay so we decided that given the fun we were having with the wind we could change our plans and camp at Munro Station and then break the remaining kilometres to Sandfire into two shorter days. Munro also had a swimming pool, which also added to its attraction. However, these newly hatched plans quickly reverted to the original plans once we found ourselves bogged in sand not far along the 2 km road into Munro Station – heavy trailers full of water do not travel well in sand! Not long after the turn off to Munro we stopped for lunch. We were amused to find the only suitable spot was near a road sign at the turn off to Bidyadanga saying that Police were targeting fatigue. Given our fatigued state we thought the sign rather appropriate. Just as we were about to leave a fellow pulled up in his car for a chat. He had just been down the road to buy watermelons for the children at Bidyadanga School where his son was teaching. Apparently not far down the highway there is a big irrigation project growing watermelons, corn and other crops. 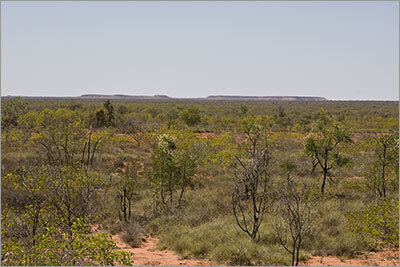 He told us it is not visible from the highway but stretches for a long way inland and is very impressive given the arid country it is in the middle of. The irrigation water used comes from underground. As we rode south we looked for this farm but could not see anything. You can, however, see it on the Google map below if you select the ‘Satellite’ overlay, zoom in to our ‘Bush Camp 090901’ for last night and then scroll south along the highway. It is halfway between our camp last night and our camp tonight. Given the arid country we have ridden through it is amazing to think that there is a big horticultural operation not far from the highway. Just add water and the place changes character completely. 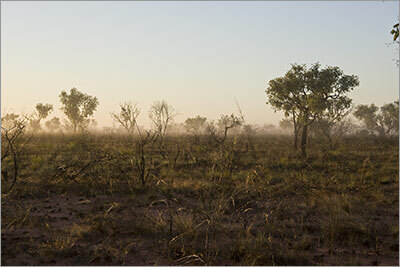 Our camp for our second night, (‘Bush Camp 090902’), was not as private as last night with the country being very open. We rode for a little over an hour looking for a good spot before sunset forced us to use a sandy drainage gully beside the highway. We were able to get a fair distance from the road but there was limited vegetation screening us. But on the positive side, the traffic was very light so there was not much noise. We awoke to a foggy sunrise and a dripping wet tent (this time we had used the fly). We wiped the tent down using the socks we put around our water bottles to evaporatively cool our drinking water, but the tent still got packed away very wet. We carry a small water allowance to keep these socks wet during the day, as it is not fun drinking warm water. A wet sock around the bottle keeps the water relatively cool. As we were about to leave, the wind started to come up and we had to contend with a head wind for about 40km. We stopped for a rest, two serves of fruitcake, some scroggin and biscuits. Whilst we were procrastinating the wind changed direction and remarkably we left with a tail wind. For the rest of the day we moved along at a comfortable pace. 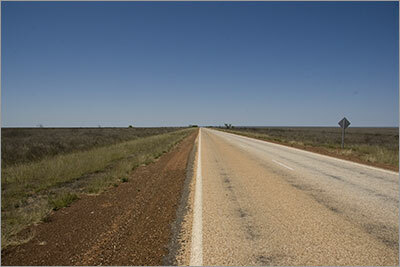 The wind, however, completely disappeared for the last 20km to Sandfire Roadhouse. Even after all these kilometres we are not sure what is best - no wind or a tail wind – either way we will have something to say about it. About 30km from Sandfire we observed a very colourful bird flying along the edge of the road keeping up with us as we rode along. From time to time it would suddenly twist and turn before landing briefly on a branch to eat an insect it had caught and then resume its flight alongside us. 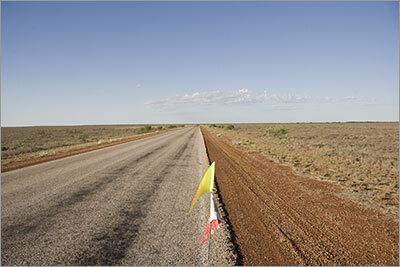 It reminded us of the Budgies that had flown alongside and between us looking at us in our mirrors near Mt Isa and across The Barkly. We later learnt by borrowing a bird book at Sandfire, that this bird was very likely a Rainbow Bee Eater, which we were amazed to discover, can also be found around the ACT. In the late afternoon light this bird’s colours are striking, particularly its bronzed upper wings – for homework look it up on the web. Sandfire Roadhouse burnt down three years ago and it is operating a reduced operation from a small transportable hut whilst plans to rebuild are finalised. The caravan park and motel were unaffected but the restaurant and bar were completely destroyed. We paid for a campsite and rode into the park to quickly upgrade to a motel room. 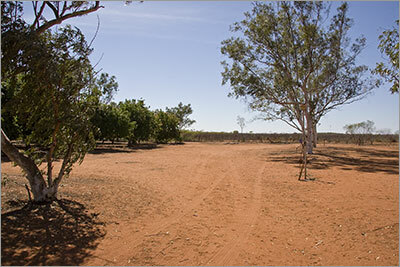 The sites were completely grass free and very dusty and we remarked we would not choose to bush camp on such an exposed site so we were certainly not going to pay to use the piece of dirt. The motel room although small was much more comfortable. 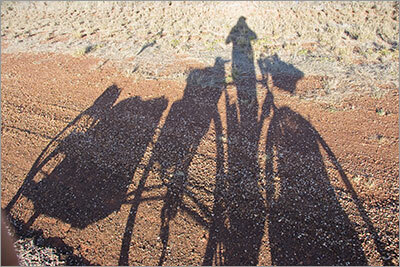 Looking back over the last three days the ride from Broome to Sandfire Roadhouse was a very long slog for us. We are not sure if it was the fact that everyone had told us this was one of the more difficult legs of our trip, or it was the head and side winds or the heavy loads we hauled for the first couple of days. (At times it seems pointless carrying all that water to only sweat and pee it out along the way!) 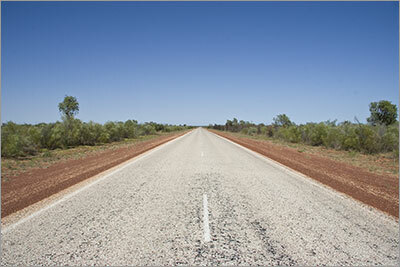 The highway is not a bad road and traffic is very light so terrain wise it is not difficult. Whatever the reason for our exhaustion we very much enjoyed our sleep in a real bed. Preparing to leave Ochre Moon whilst the other guests are only just sitting down to breakfast. Packing up from lunch. This was one of the shadiest trees we have seen for a long while.